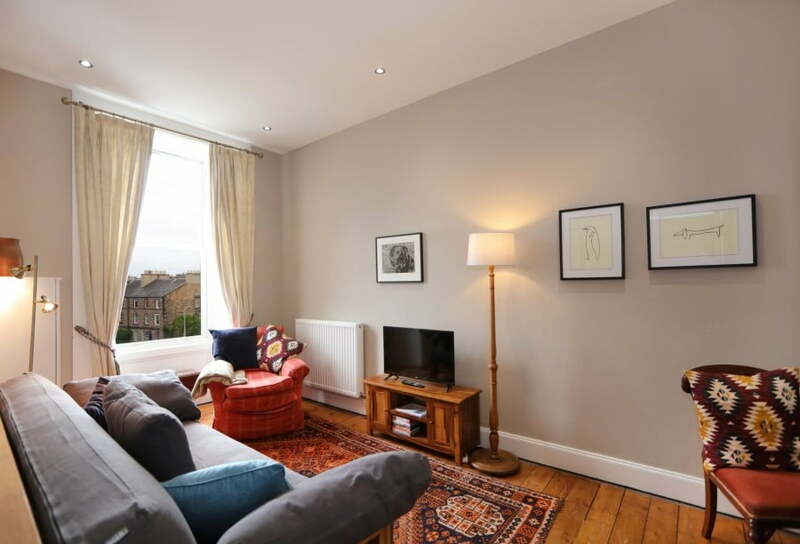 Canonmills is a welcoming self-catering apartment located on bustling Howard Street. A range of local cafes and eateries are in the vicinity and a Tesco superstore on Broughton Road is a mere five-minute walk away, so the property provides excellent access to conveniences. The acclaimed Water of Leith Cafe below the apartment serves breakfast from 9am, while those who enjoy pub food can avail of The Orchard just across the road. Situated on the second floor, the accommodation comprises a double bedroom, sitting room, kitchen, and shower room. The bedroom is off the left, past a bookshelf with a selection of local titles, and has a fabric armchair and storage unit with wicker drawers. A large adjoining walk-in wardrobe contains a dressing mirror and hairdryer. The apartment’s sitting room serves as a great space to relax in with a large, comfortable sofa which can convert to a bed opposite a 32-inch HD TV with integrated DVD player. The room contains an additional plush armchair and an extendable dining table with seating for four. At the far side are the boiler cupboard and an internet booster to ensure strong Wi-Fi throughout the flat. The adjacent tiled wet room with shower curtain has a heated towel rail and electric under-floor heating. The apartment’s kitchen boasts a breakfast table for two and all essential accoutrements, including a fridge with freezer compartment, hob and oven, microwave, kettle, toaster, and a selection of cookware and eating utensils. A French Press is also present and the apartment’s washing machine is housed here, with a clothes horse, iron and ironing board kept in a utility closet off the hall. Each of this self-catering apartment’s rooms sports a window looking out over Inverleith Row and a portion of the Water of Leith. The property includes a key for an expansive shared and well-tended garden accessed via the basement of the communal stairwell, so you need not even venture beyond the premises to enjoy a relaxing outdoor haven. Canonmills makes a great retreat for visitors to Edinburgh, offering all essential facilities as well as access to a communal garden in which to unwind, while the tranquil retreats of the Water of Leith Walkway and the city’s renowned Royal Botanic Garden are also close by. Inverleith Park is ten minutes’ walk away and a perfect place for picnics and unwinding by its pond. It also proves a great vantage point to Edinburgh Castle and the Hogmanay and end-of-Festival fireworks. The property is similarly near the boutique shops of Stockbridge, concentrated along Raeburn Place, with the main tourist attractions of the busier Old Town still within comfortable walking distance. The amenities both inside the apartment and around it therefore serve as a strong offering to those seeking comfort and convenience for their trip to the city.